Several systems are on tap for the short term forecast with 2 decent dumps for the Sierra (2-3 feet) and at least a foot for many areas of the Rockies. There may be a short break late Tuesday before a warmer atmospheric river ramps up for the Sierra and eventually dumps additional snow into the Rockies. The Pacific Northwest will score blower pow this Saturday and again for early next week favoring the southern regions. It will be snowing at sea level in Washington and Oregon Friday night! Beach Pow! The Sierra is in the spotlight again for late Friday to Saturday with storm #1 bringing 7-14 inches to most of the Lake Tahoe basin. NW flow will bring very cold temps, high-quality powder and moderate winds. The only caveat I see is that 50% of the snow may fall Friday night with the next round during the day Saturday (Less overnight snow than previous storms). Winds don't appear to be overly strong for this system, so most resorts are likely to have lifts spinning. 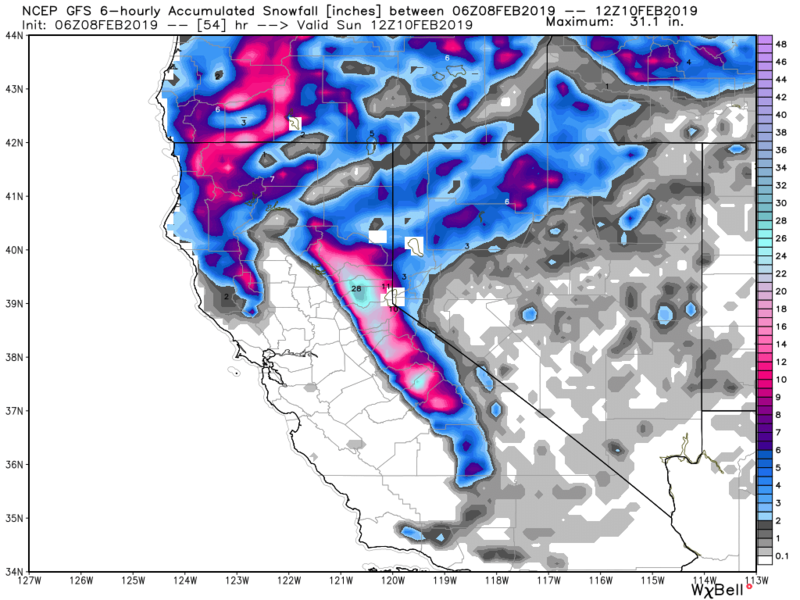 The northern Sierra may fare better than the southern regions near Mammoth. Winds will likely increase by late Saturday. Below: Total snowfall of storm #1 and #2 for CA. 11 inches on the map designates Truckee however amounts will be higher due to higher snow ratios (15:1). The mountains are in the 2-3 feet range on the Crest. Below: Strong winds Saturday night and Sunday may decrease by midday in the Sierra Sunday. It's a gamble that may be worth waiting for but no guarantees. Chase gambles. The PNW gets it's the first truly cold storm of the season beginning late Friday and continuing through Saturday. This system favors chases to the southern Cascades of WA and most of the Oregon Cascades. Look for morning pow on Saturday of 7-10 inches for Crystal, 4-8 for Stevens, and 3-6 for Baker. Snoqualmie and Alpental will fall in the moderate range. 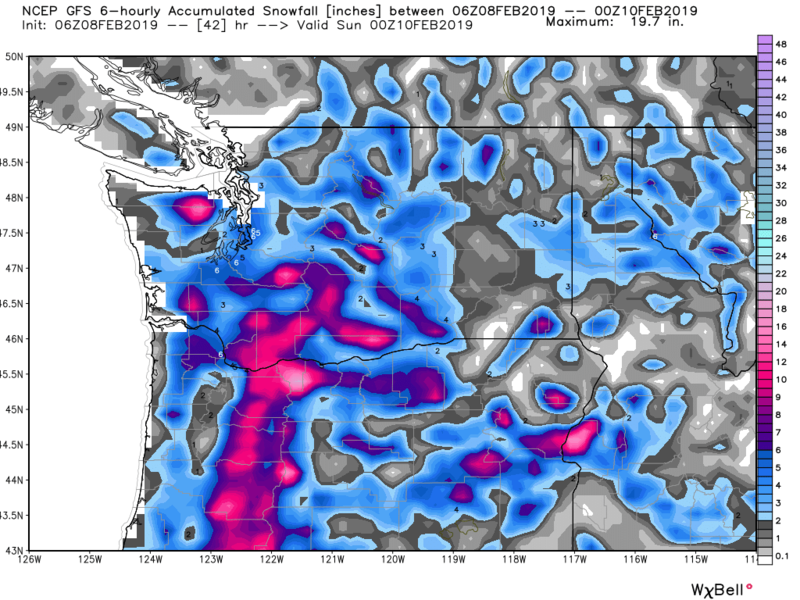 The Oregon Cascades may see higher amounts especially Timberline Lodge and Mount Hood. Bachelor should score nicely! In WA some of the pow will fall late Friday with the remainder overnight into Saturday. Oregon grabs mostly overnight freshies into Saturday. Light Density pow will offer high quality to all of the Cascades of the PNW, however, you may end feeling the firmer surface below. The groomers may ski better than off piste? The streets around Seattle extending south will see the highest amounts of 3-6 inches so expect significant traffic issues later Saturday morning. "Get an early start Saturday"
Below: Total snowfall for WA/OR by late Saturday. Lowland snow extending to the coastal areas. Highest snow totals in the OR Cascades including Bachelor or areas near the WA border. For the Rockies and most of the intermountain west, I really like the odds of 8-14 inches for central and southern Idaho resorts Saturday afternoon through Sunday. The Tetons will also ramp up on Sunday with the heaviest falling into Sunday PM and during the day through Monday (6-12). This storm should push further north than the previous one with Big Sky, and Bridger in scoring position for Sunday-Monday (6-10). Confidence in MT is slightly less than the Tetons. Further north in Montana Whitefish and areas of central MT grab moderate freshies primarily late Friday to early Saturday (4-9). The extended forecast may continue freshies for these areas into mid or late next week. The Wasatch delivers Sunday PM through Monday with most resorts in the 5-10 inch range. 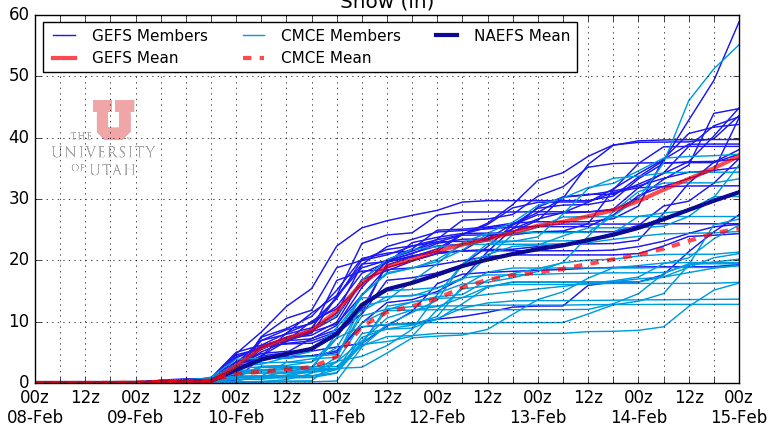 The Cottonwoods are likely to be in the 10-15 inch range (LCC favored over BCC) by late Monday. Powder Mountain also scores well in this pattern with the University of Utah Plumes showing double digits through late Monday. A second piece of energy hits the Wasatch Monday night/Tuesday with another 4-7 inches likely. Storm totals early next week should range in the 10-20 inch range with higher amounts possible in the Cottonwoods. Riding Monday and Tuesday should offer good rewards. Below: University of Utah Atmospheric Sciences plumes showing the dark blue or red lines (Mean averages) in the 10-20 inch range by Tuesday for Powder Mountain. These plumes are often overdone and notice there are several lines further below showing lower confidence. Regardless, it's likely that heavy snow is likely for the northern and central Wasatch of Utah favoring resorts with NW flow. Colorado grabs leftovers for Monday/Tuesday (Storm ski Monday and grab freshies on Tuesday). Some light snow may be falling on Sunday. Totals in Colorado will be widespread of 5-10 inches. The higher amounts may land in Aspen, Steamboat, Beaver Creek, or Crested Butte. SW winds initially will be good for CB and Aspen before the shift to the west later Monday. West winds can put down equal amounts of powder for many areas of Colorado. Steamboat sometimes comes up with surprises on this pattern. Most of the I-70 corridor will see a nice shot of moderate pow primarily on Monday extending somewhat into the evening. A warmer atmospheric river will set up over the Sierra mid to late next week. Significant high elevation snow will be falling above 7,000 feet. Those systems are likely to pump decent moisture into much of the Rockies mid to late next week. Another round of moderate to heavy snow is likely favoring Oregon Tuesday and much of ID, MT, WY, UT, and Colorado at some point Wednesday/Thursday. Please consider any donation. All donations of $50 or more get you to our concierge level. This includes custom POW forecasts upon your request via email. $100 gets you the same program with a swag pair of $25 Merino Point 6 Socks. Any donation regardless of amount can keep the chase going. 10% of donations get donated to avalanche centers in the west. Keep powderchasers forecasts coming! See the full description of our Concierge levels on the website. Sign up for mid level and higher powder concierge now and recieve benefits through all of the next season! Sign up to get powder forecasts in an email before a big storm! Did you know that we offer custom forecasts and trip planning? Sign up for mid level and higher powder concierge and recieve benefits through all of the next season!